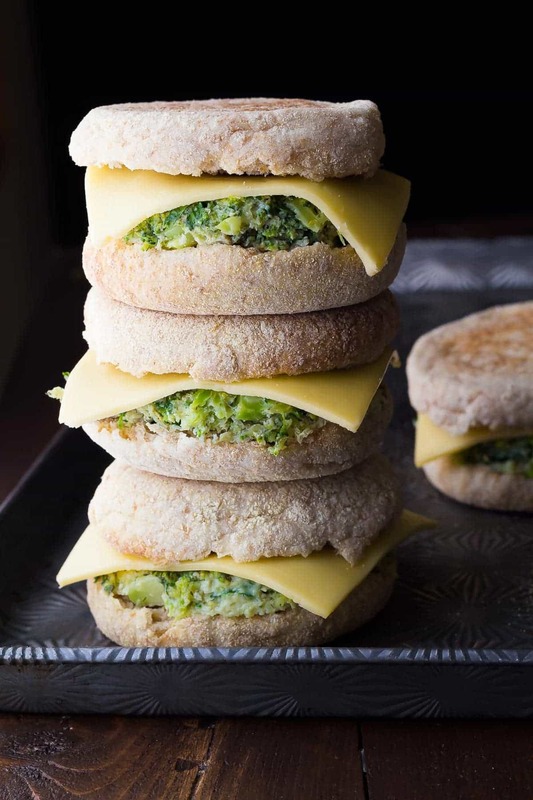 These healthy freezer breakfast sandwiches are so much healthier than the drive thru! Packed with veggies and ridiculously easy to make. Can we start the weekend over? I wasn’t ready. That’s how I feel every Monday. Except today, I have a little more pep in my step (considering…MONDAY), and it’s all thanks to these healthy freezer breakfast sandwiches. I have only just discovered that breakfast sandwiches don’t have to come from a drive-thru and they also don’t have to be full of processed ingredients. Say what?! Eating one of these beauties was a pretty awesome way to start my week. My curiosity was piqued and I had to try making my own breakfast sandwiches….just to see. And not only were they tasty but they were RIDICULOUSLY easy to make. Not only that but you can totally customize the egg portion, and load it up with veggies. 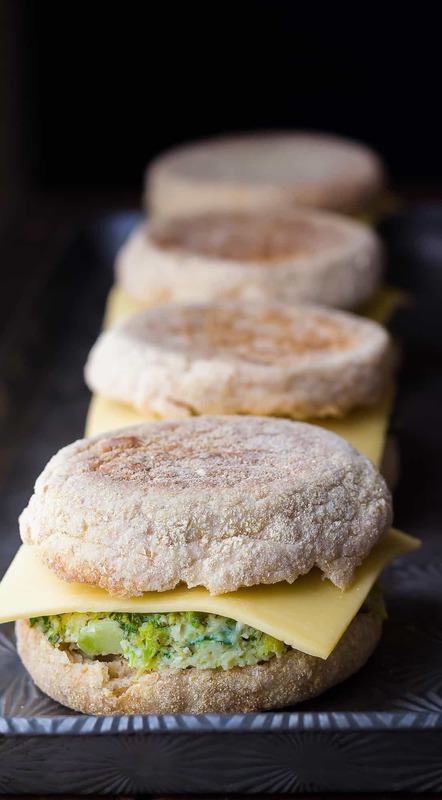 For these freezer breakfast sandwiches I combined finely chopped broccoli and spinach with some feta cheese, and topped with a slice of havarti. Breakfast heaven. 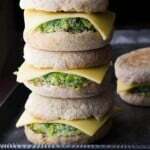 So friend, how easy are these freezer breakfast sandwiches to make? 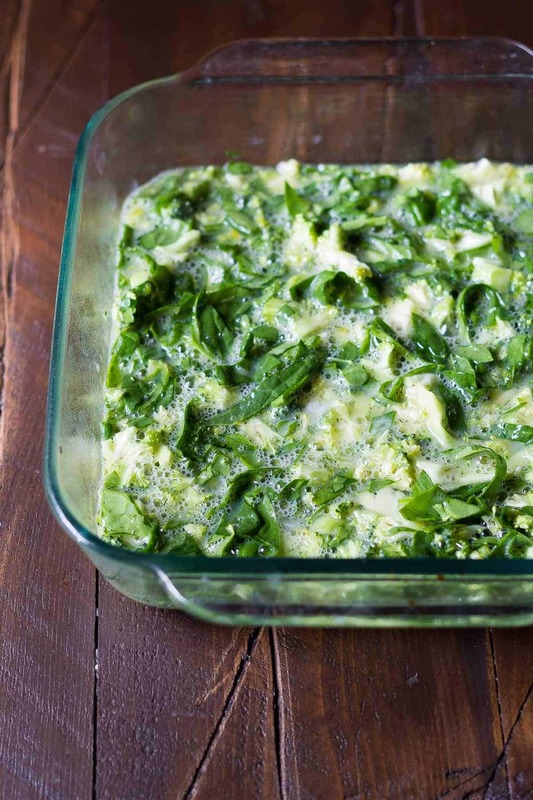 Beat together your eggs, milk, salt, feta, and veggies. For the sandwiches pictured, I used broccoli & spinach. Bake up for 20-25 minutes. Cool. I’m only just getting started with these babies. I’ll keep you posted on other flavor variations, but I definitely plan on testing some sundried tomatoes, roasted red peppers, and leeks. Once your eggs have cooled completely, you can cut them into circles (as pictured above), but you’ll end up with scraps. I actually prefer to cut them into squares. That’s what I do these days. No scraps and just as tasty! 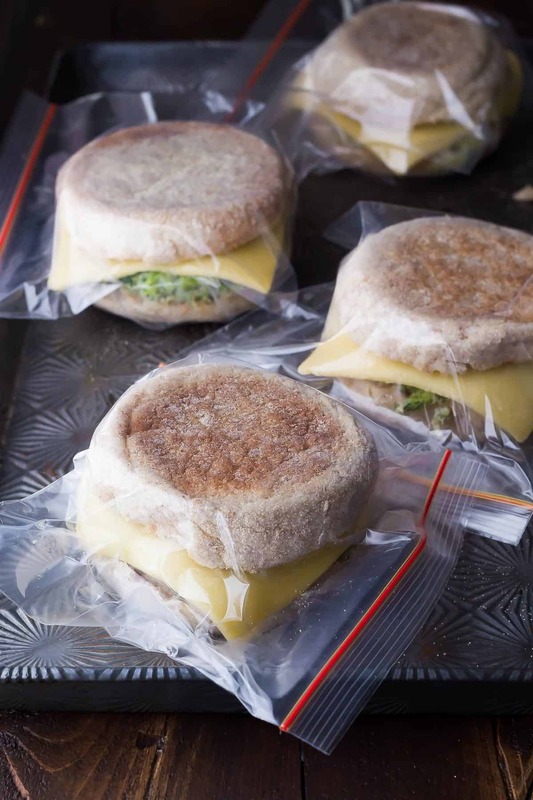 Then assemble your sandwiches, wrap in baggies, and freeze until you’re ready for a healthy, filling and not to mention, TASTY breakfast! Because on Mondays (and to be honest, every morning for me), an easy breakfast is just what you need. More easy breakfast inspiration for us! or how about these Broccoli Cheddar Breakfast Quesadillas? Re-heating instructions:Thaw overnight in the fridge (if frozen). Looking for more meal prep breakfast ideas? Hi, this looks delicious! Is it possible to freeze just the filling and then assemble in a sandwich later? Hi Janani, sure, that would work! Can I use normal bread slices instead of the English muffins? I haven’t tried…it might be better on a bun or bread roll. I used the ripple milk (pea protein) and it was delicious! Thanks for the recipe! Have you tried this with egg substitute? My husband is only allowed three egg yokes a week (due to heart issue) just wondering if the substitute would work with this? You can use Egg Beaters and similar anywhere you can use raw scrambled eggs in my experience. They don’t work as well in baked goods as your cake won’t have as much rise to it for example. What brand of English muffin do you use? They don’t look like Thomas’. Hi Ann, I’m not actually sure which brand I used, it was probably the brand from the grocery store bakery. I often shop at Loblaws or Co-op (I’m in Canada). Would this work for school lunch? What do you think? 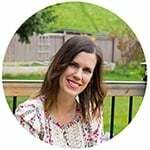 Could I sub egg whites for the whole eggs? Hi Mollie, I’ve never tried that. If you try it, would you let me know how it turns out? 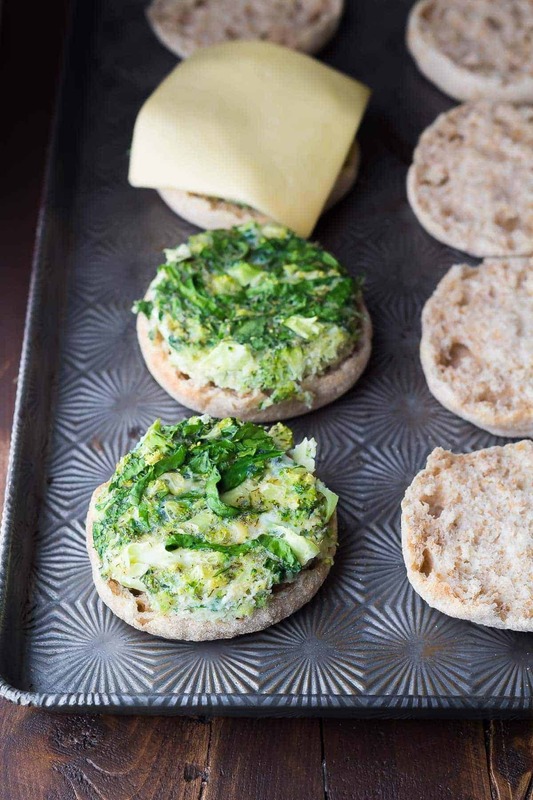 I make egg white muffins with spinach and veggies. This will be so much easier then the muffins. I add salsa on top and then take every morning fro breakfast!! These are soooooo good!!! I also alternate with swiss, its great. Looks delish! Going to try this tonight. Can I use goat cheese instead of feta? I bet goat cheese would be delicious, but I’m wondering if you might need to increase the salt slightly without the feta? Let me know how it goes! This may be a stupid question but do we have to heat up the broccoli and spinach before mixing with the egg and feta cheese? I don’t heat them up or pre-cook, if you cut the broccoli nice and small, they cook through while the eggs bake. I prefer using frozen (thawed) spinach because it wilts a bit and is easier to stir in, whereas fresh floats to the top, but you don’t need to cook the spinach either. I hope you like them! What a clever idea – and a delicious AM solution! I bought my husband some breakfast sandwiches that were on sale and then I was getting so mad that I didn’t have any to eat, haha! I’m totally making these because the bowl of cold cereal i just ate was not quite satisfying! You must have read my mind, Denise, because I was SO craving a breakfast sandwich from a certain fast food place this past Friday (I wonder which one?!) and I was thinking how easy it would be to make up a freezer-friendly similar batch. Even better that yours are healthified versions! These look awesome! Just wondering, do you toast the English muffins before freezing? Hi Robyn, I didn’t toast the muffins, but you could definitely try that!